which features a vaulted ceiling, exposed oak beams and another (nonworking)fireplace. 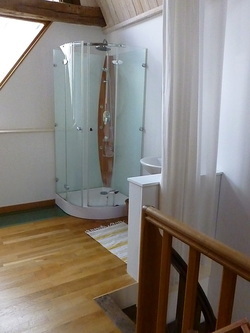 There is an ensuite shower and sink upstairs and a separate WC downstairs. plus an infant in a folding crib cot and/or another person or couple on the sofabed. It is possible to accommodate 4 guests total.